Have you heard that song – A Horse With No Name? That’s how you feel after one week of wandering the Sahara desert in Morocco. 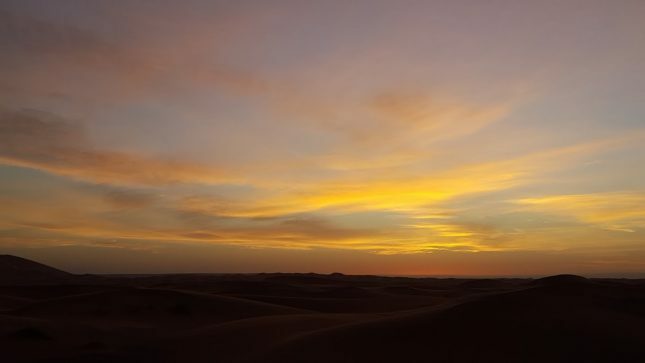 The soft sea of unmarked sand blending into the pastel sky while you smoke hashish with the locals is a rapturous reality; you are no longer dreaming. Later, when you look up at the night sky, the sum of stars is something you only ever imagined. I remember laying on a mattress beside our tents with a big blanket to keep warm as the night chill swept in. There was about 10 of us, Canadians, Spaniards, Italians, Russians and Americans – All taking turns describing what we saw as we gazed up high. Rewind one week… I had been on the road for more-or-less two months. I was tired and ready to go home when I was sitting at breakfast in Lisboa, Portugal. I was searching with Skyscanner for a cheap and easy flight to familiar Toronto. A couple of guys, French I think, sat beside me, and we exchanged stories. After a while, one of the two concluded that I had to keep travelling, ‘Definitely don’t go home man, keep roaming’. I didn’t think much of it at the time, but it got me intrigued. I booked a flight later that afternoon for Morocco, Lisboa to Casablanca and Casablanca to Marrakech. Waiting for my flight from Casablanca to Marrakech was the first time in my life I felt like an outsider – even scared. But that animated me. After all, I left home to experience the world for what it was, not as it seemed on North American television. It was dark when I arrived; I hopped into a taxi at the small airport, the driver was reckless. He dropped me off at Jamaa El Fna, the main square, ‘No more taxi, you walk from here, five minutes that way’ he muttered. Stepping out of the taxi, groups of men ran up to me, hustling and peddling me anything and everything they could. At this point, I had completely lost my sense of direction standing in the frenetic Jamaa El Fna, the taxi driver’s instructions of no use. 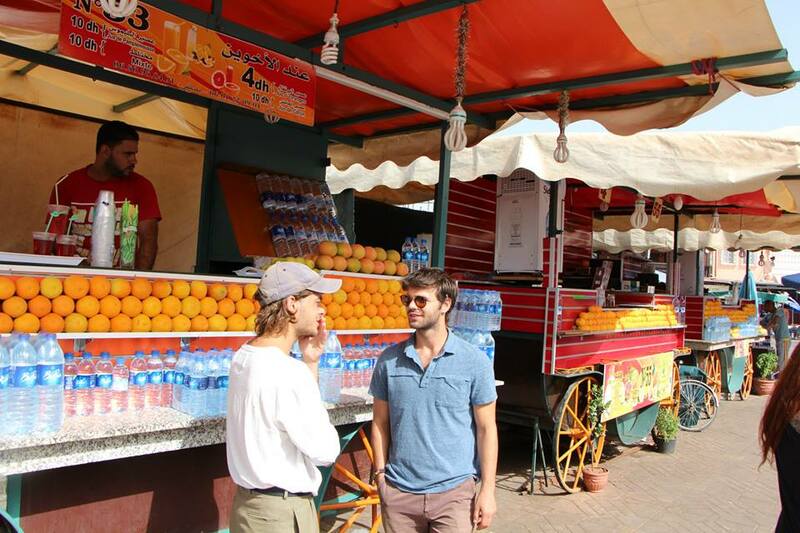 I let one of the hagglers walk me to the Marrakech Rouge, the hostel, where I was staying. He was walking fast, taking me down small dark alleyways; I didn’t know if I was being guided to my hostel or hell. Finally, I arrived and was greeted by three young men with big, shining smiles painted on their faces. I was immediately offered fresh mint tea before discussing business. I met a Brazilian girl at the hostel; we had both just arrived and were completely culture-shocked. She only spoke Portuguese and French; I tried my best to chat with my broken French as we wandered the souks of the Medina, ultimately heading back to Jemaa El Fna in search of some food. The square was filled with a thousand food stalls, goofy men throwing snakes and monkeys, street bands playing steel drums with people dancing, tempting fresh orange juice stands, all attempting to lure your money. The vibe was intense and the temperature hot – I was enjoying myself. 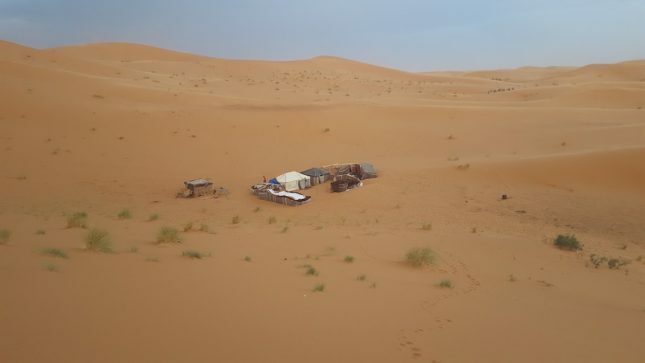 After a couple of nights at the hostel smoking a lot of Shisha and drinking heaps of fresh mint tea, the Brazilian girl and a new buddy, a guy from Australia, decided to book a trip to the Sahara. It took a full day of negotiations and haggling with multiple vendors before we finally found a reasonable price. The bus ride was an incredible eight-hour journey through hills and gorges to our first hotel. We passed through rose fields and thousand-year-old castles where recent movies had been filmed. The next day we carried on through small villages meeting the locals until our bumpy bus ride was over; dropping us off with the Berbers on the edge of the Desert. Their hearts were warm, and life was moving at a much slower pace; a refreshing contrast to chaotic Marrakech. We were paired with camels and headed towards our camp located in the middle of the desert. The camels were as uncomfortable as those bull riding gimmicks they have at country bars. I asked one of the Berber’s if I could hop off and walk with him to the camp. We headed off, trudging up a sand mountain and wandering on the hot sand to our new home. “Isn’t crazy that we can just pick up our phones and get an answer to anything we want? ” My name is Julien Miro; I come from Toronto, Canada with a Bachelor of International Tourism Management. My passion is travelling with a small bag, that way I can carry more memories than things. I always try to take photos of my journeys and scribble what went down. I am rather old school that way: pencil and paper to capture the truth of the moment! That way I can share the hidden roads and unknown paths I have stumbled upon with friends and family around the world.